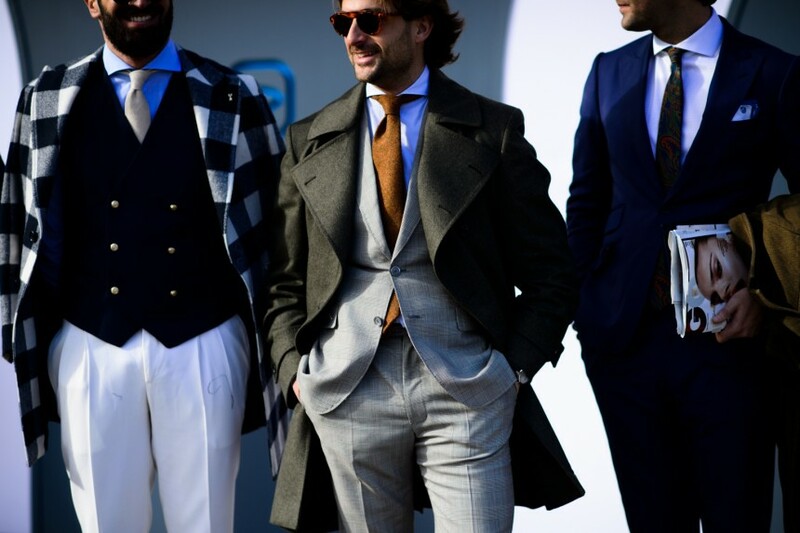 All the ladies may be getting ready for next month’s frenzy of fashion weeks in New York, London, Milan and Paris – but let’s not forget what’s happening right now: Mens Fashion Week! Whilst designers have been presenting the most covetable menswear collections for autumn/winter ’16, the male fashion pack have been busy striking a pose for the best street style photographers, setting the trends that matter the most: the street trends happening right now. 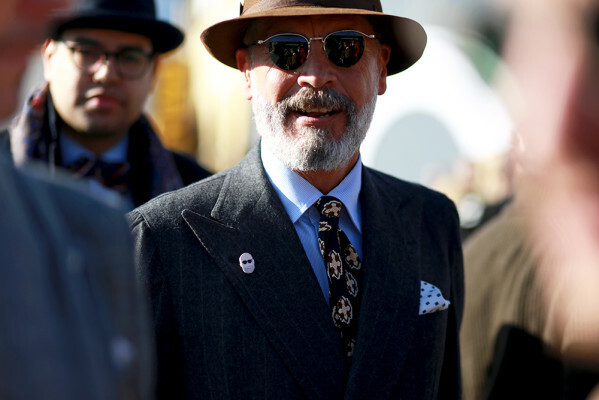 Amidst the bomber jackets, turtlenecks and classically oversized coats, we spotted one of our favourite My Kind Of Tie things: ties! Which are your favourite looks from this year’s amazing street style? We can’t blame you for finding it hard to chose – don’t forget there’s still Mens Fashion Week in Paris to look forward to! 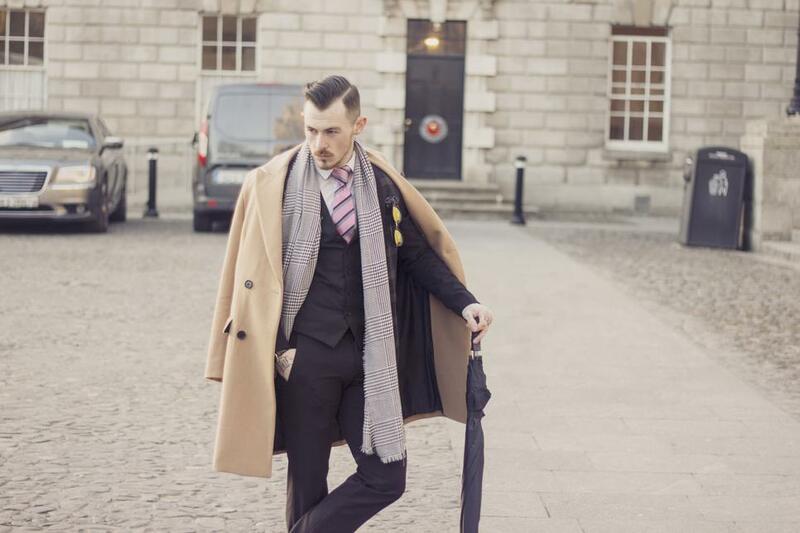 We are thrilled to announce that our latest blogger spotlight is with Irish fashion blogger Damien Broderick, one of Ireland’s top male bloggers. 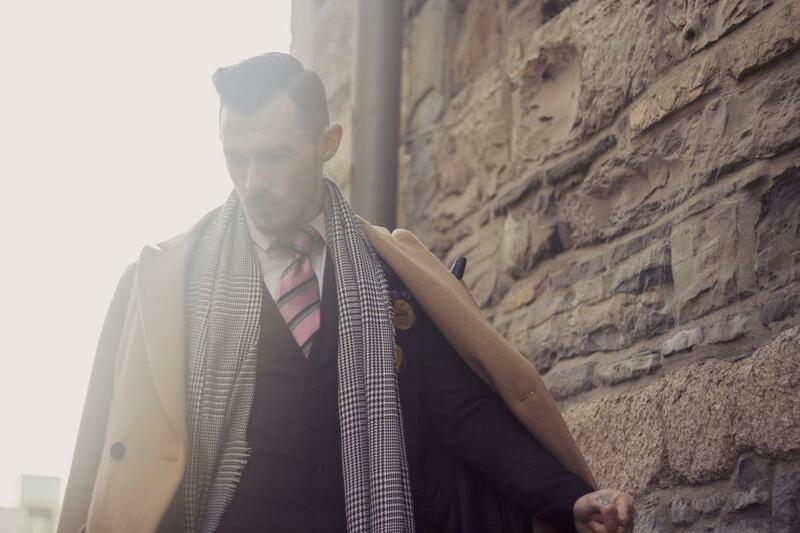 The ridiculously stylish blogger showcased two of our pieces in his latest blog post, aptly titled “How To Be Dapper.” Talk about a lesson in style! 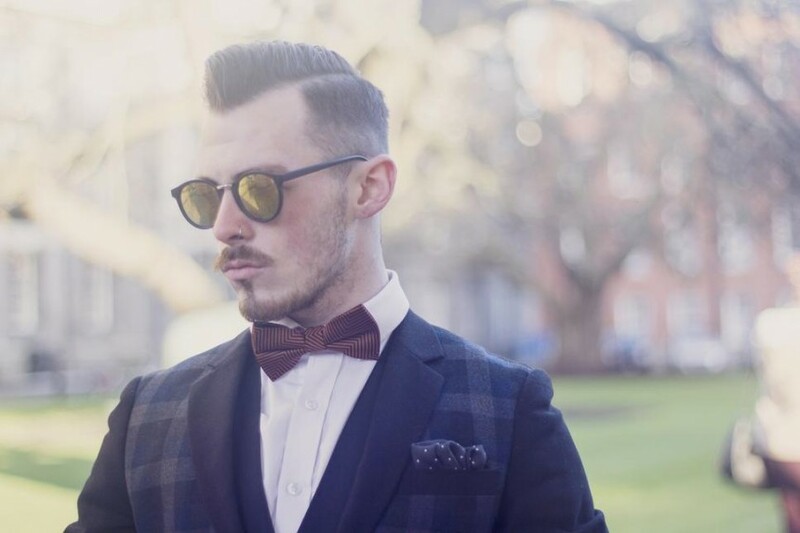 Damien styled our charming Tobias striped bow tie in a classic yet dashing way. 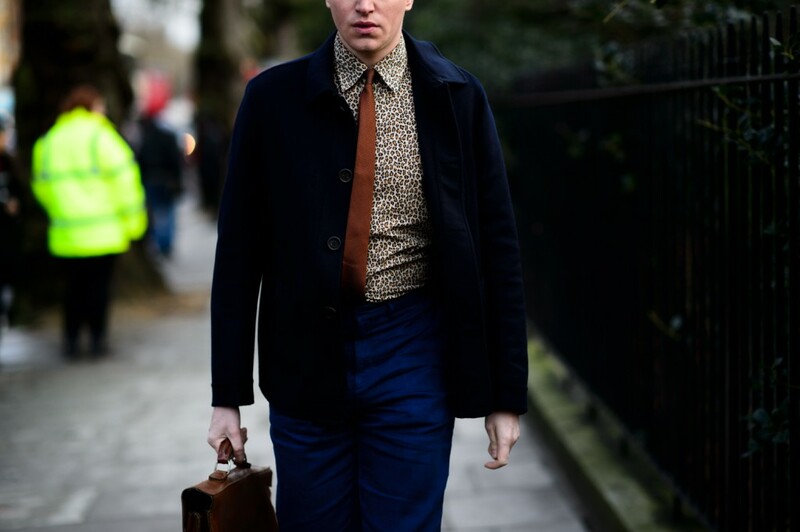 We love a good print clash and Damien seems to have mastered it in such a way that it’s a true art form! The jacket may have its own statement print but its slim and muted tones are a surprising match made in heaven with our bow tie. The dotted pocket square makes for a playful finishing touch – eye-catching yet subtle. 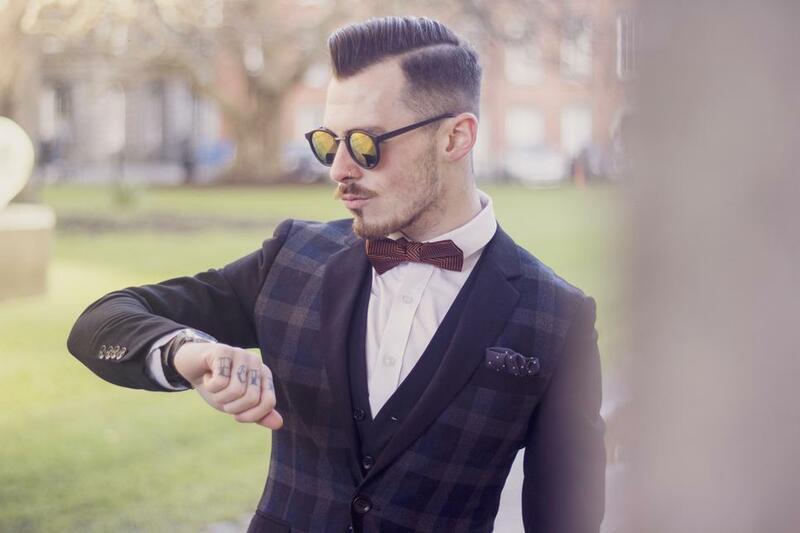 The perfect balance between sophistication and on-trend style, we love Damien’s take on dapper style. 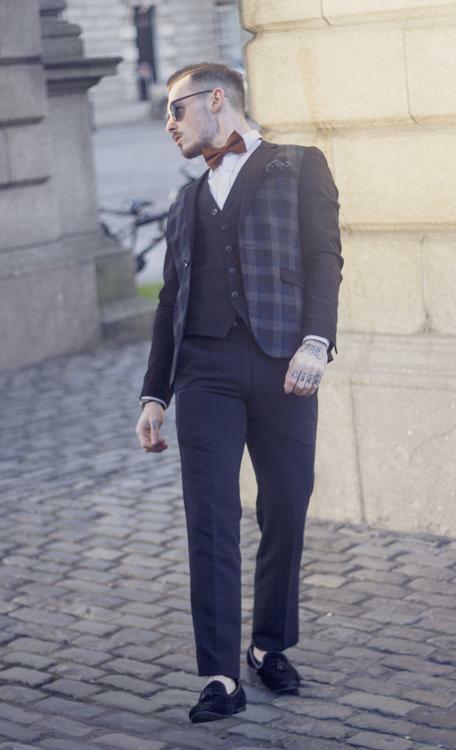 The waistcoat, slim trousers and loafers all have timeless appeal and yet they give this look a thoroughly modern feel. The burnt orange shade of our Tobias bow tie, of course, stands out beautifully against the navy backdrop. 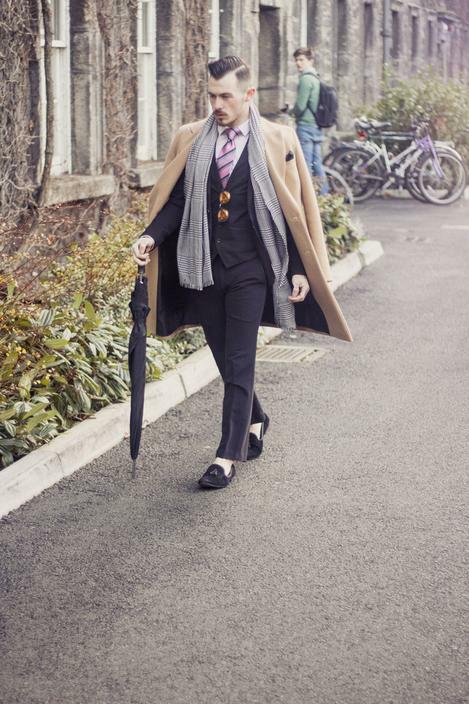 Damien also threw in our pink Gilbert tie into his fabulous mix of prints. Adding a super chic camel coat and houndstooth scarf, the print mesh up worked wonders yet again thanks to the soft tones in our timeless Gilbert tie. 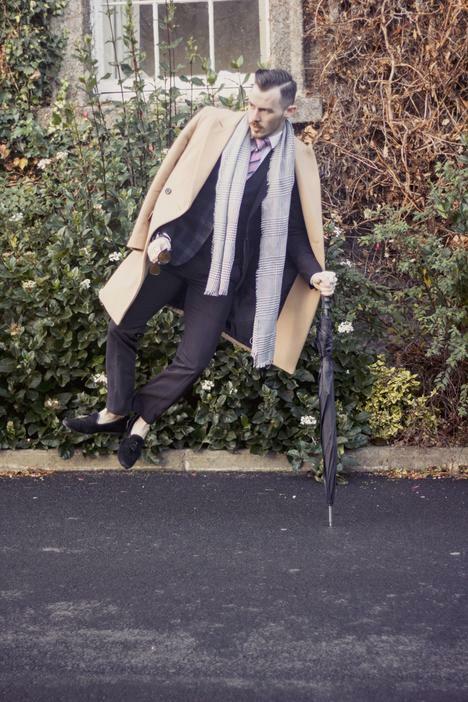 Damien proves that dressing like a true gentleman need not be boring, don’t you think? 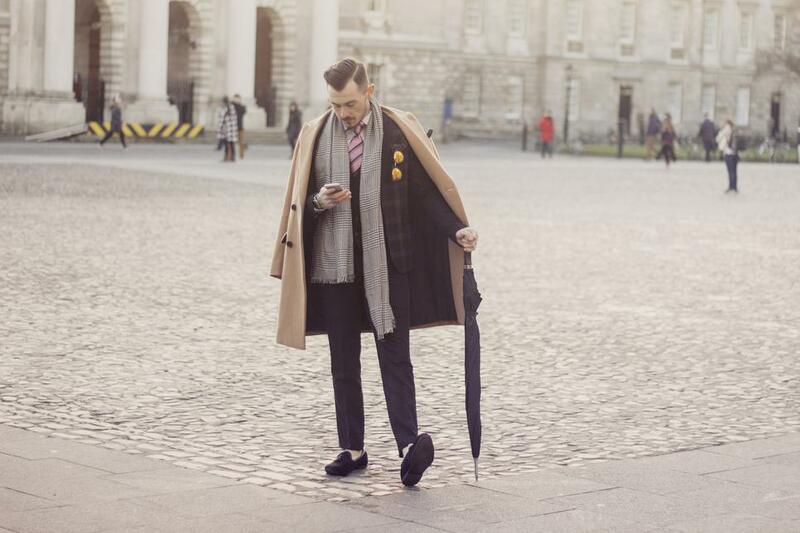 If any of you gentlemen are looking for style inspiration during this festive season why not take a leaf out of Damien’s book and put a modern spin on your classic staples? 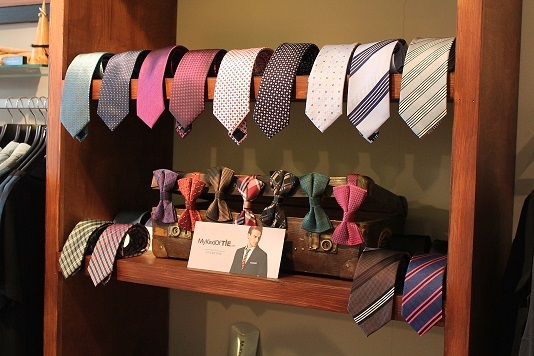 Our ties and bow ties will do the trick! Many thanks to Damien for such a fab review of our items – you can see more pictures and see the full post here. Don’t forget to dress like a gentleman this Christmas with My Kind Of Tie. Merry Christmas and Happy New Year from all of us at My Kind Of Tie! ©Sika Photography for Damien Broderick. Can you believe there are only 4 days left til Christmas? Here at My Kind Of Tie we are spoilt for choice for stocking fillers, as who wouldn’t love our ties and bow ties for Christmas! 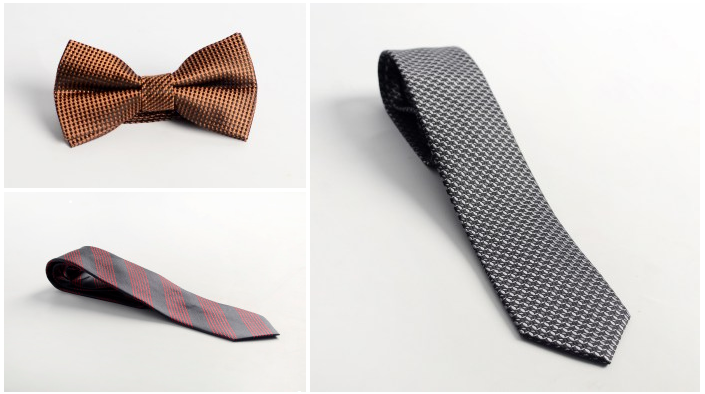 Clockwise from top left: our Qincy bow tie, Alex tie, Trey tie. 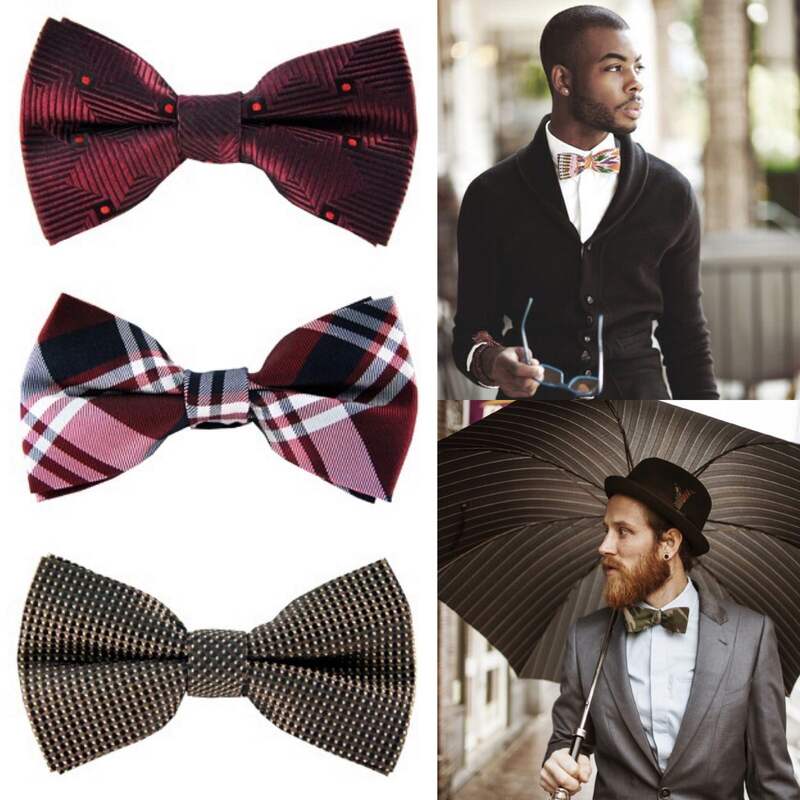 Clockwise from top left: our Channing bow tie, Jonathan tie, Jayling bow tie, Jacob tie. We suspect Nirina may be a little parcial towards the colour blue… who can blame her? This one is our Nicholas tie. 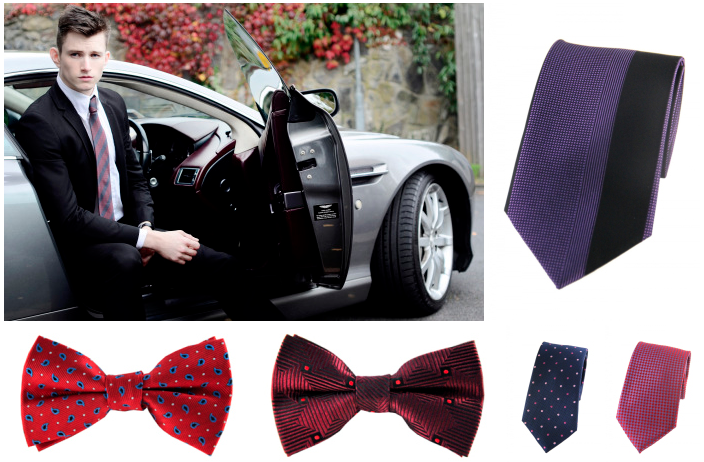 Clockwise from top right: our Oliver tie, Rohan bow tie, Ronan bow tie, Dylan tie, Elias tie. A big thank you to the lovely Nirina for including us in her Christmas Gift Guide – you can read the full post here! Ladies, don’t forget to fill up those stockings and gentlemen, don’t forget to add lots of My Kind Of Tie pieces to your last-minute Wish Lists. Let the Christmas countdown begin! Keep in touch and follow us on Facebook / Twitter / Instagram. 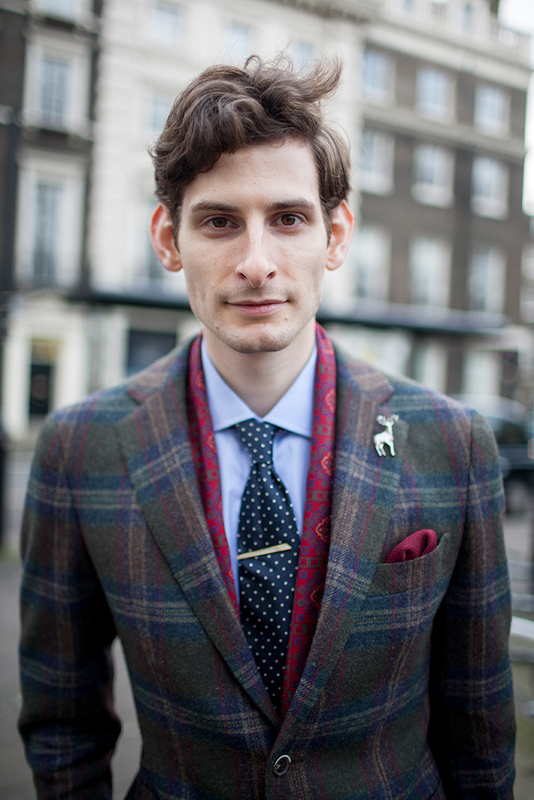 Here at My Kind Of Tie it’s no secret that we love prints in all shapes, colours and sizes. And whilst normally we would say one print at a time is enough for a gentleman, we also believe in stirring things up a little too. 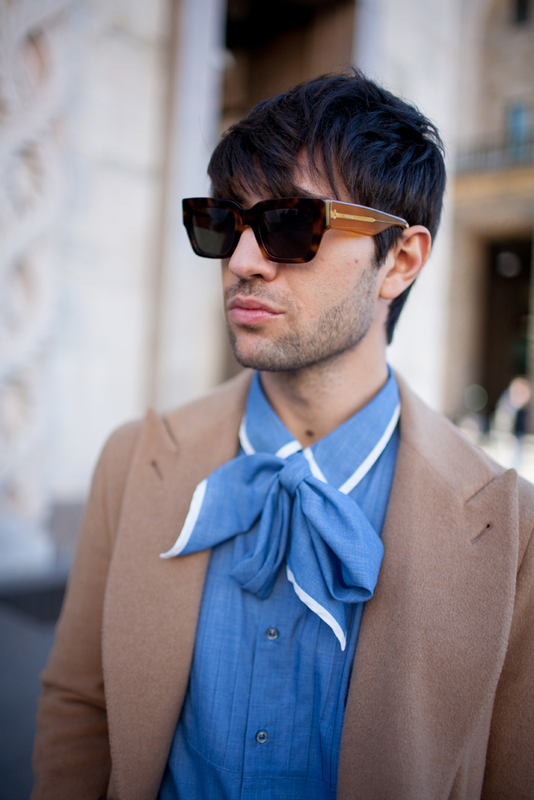 So why not go print clashing and wear one of our fabulous My Kind Of Tie print bow ties with a printed shirt? This fashion-forward trend will surprise you for all the right reasons, providing a quirky, highly individual look. Not convinced? 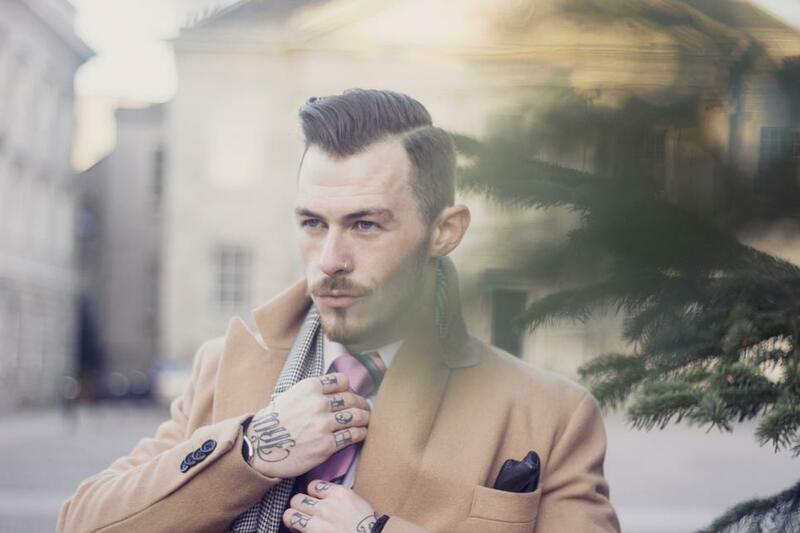 Read these tips on how to pull off this unashamedly trendy and unexpectedly chic look like a true gentleman. Try stripes on stripes. 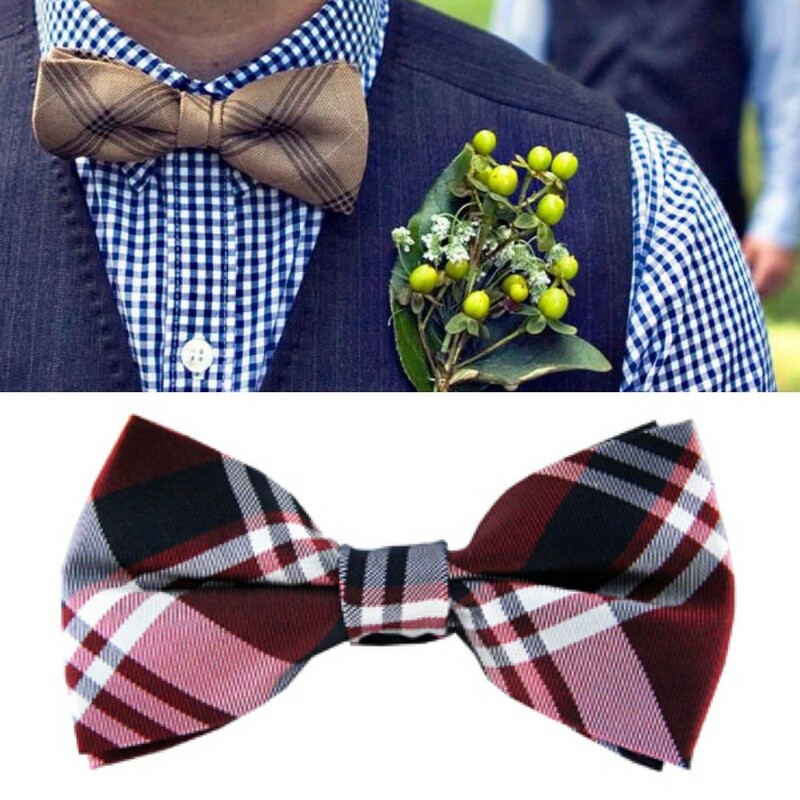 A striped bow tie and striped shirt? It might sound like a stripe overdose but the key is to be playful with the choice of stripes – the more different in size, the more stylish you will look. 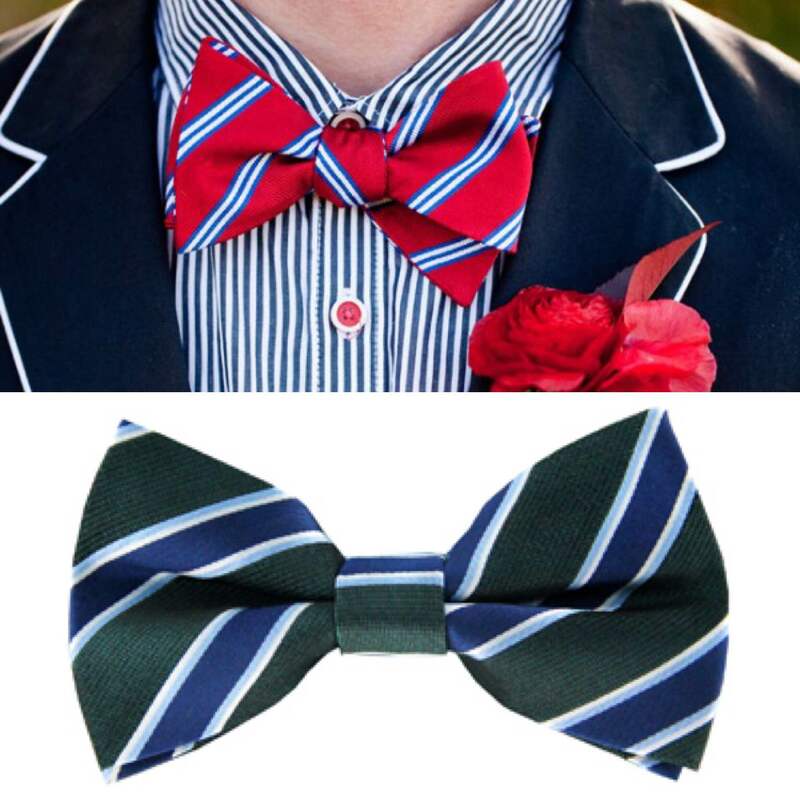 Our Kobe bow tie will look dashing with a striped shirt. Or go for contrasting shapes. Dots on stripes? Florals on stripes? Chequered on chequered? 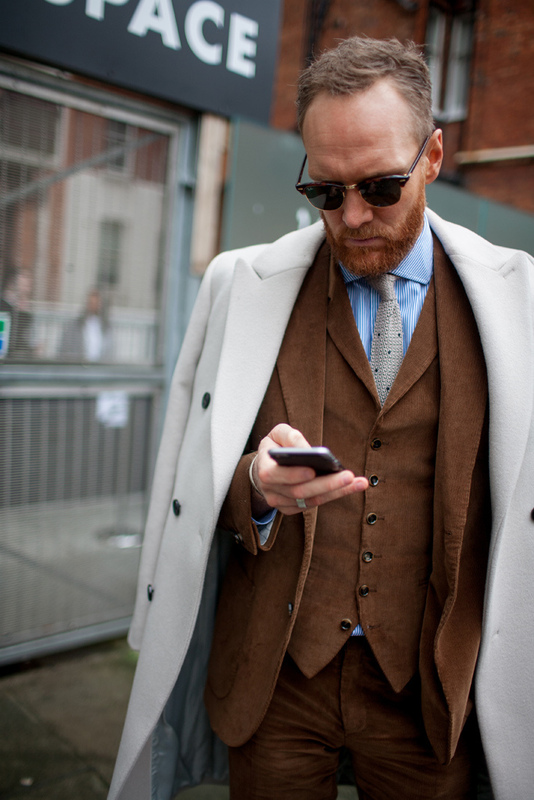 If you get the colours right, it’ll look dashing. Our charming London bow tie proves that florals and stripes can work wonders. 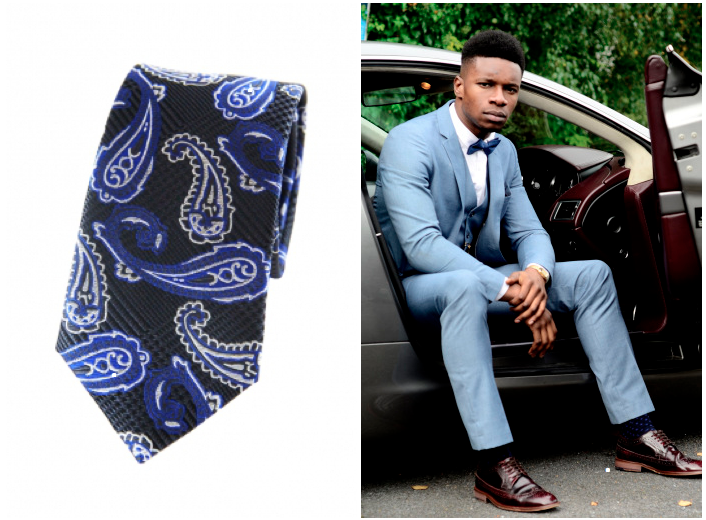 Our Eddie bow tie will contrast beautifully with a print shirt that has navy or blue tones. Chequered shirts can make great alleys. 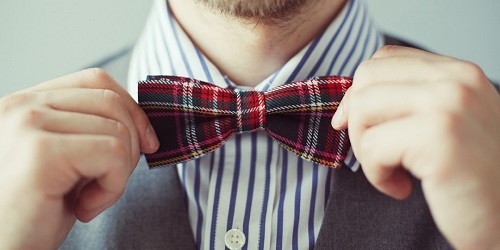 Yes, it might seem unlikely, but in the same way that striped shirts can be the perfect base for printed bow ties, simple chequered shirts be a playfully chic backdrop. 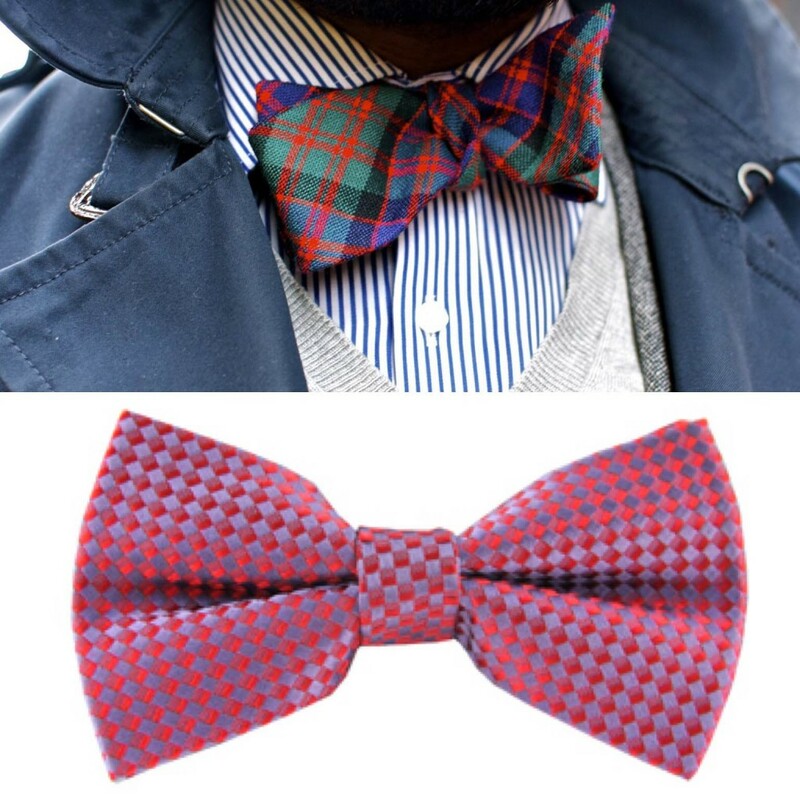 Our Trace bow tie will look bold and beautiful with a subtly chequered shirt. You can stick to similar and subtle shades. If it all gets a bit much but you are still keen on the print on print look, keep your bow tie and shirt choices simple by going for classic shades and subtle prints, both in the same colour palette – there’s nothing wrong with small dots and thin stripes. 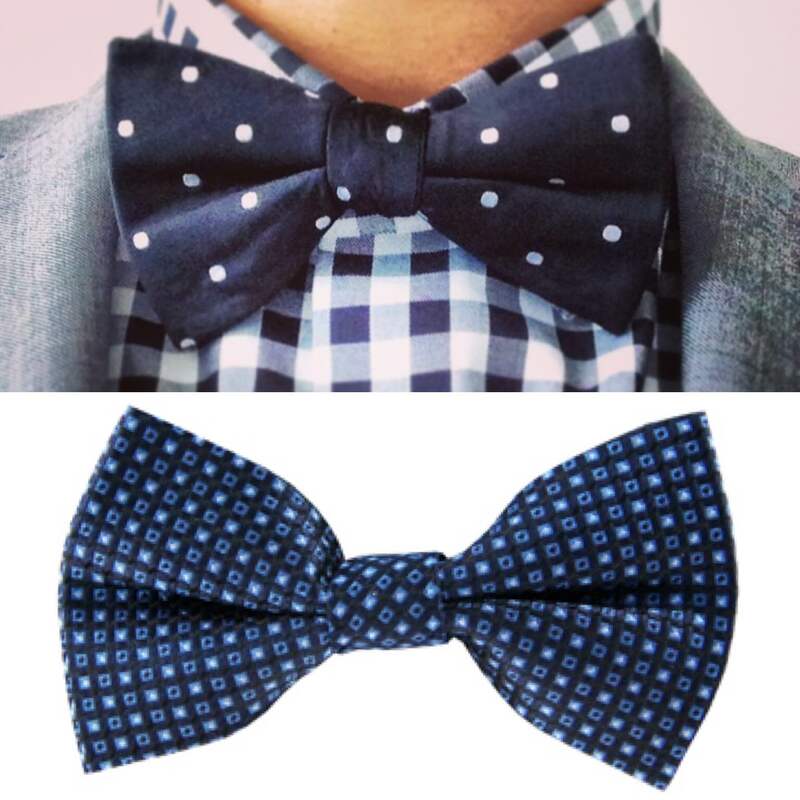 Our Franklin bow tie will stand out against a blue printed shirt thanks to its dotted print. We won’t blame you if you decide to stick to the plain yet classy look – shop our varied selection here and follow us on Facebook, Instagram and Twitter for more inspiration! Our Travis striped tie. 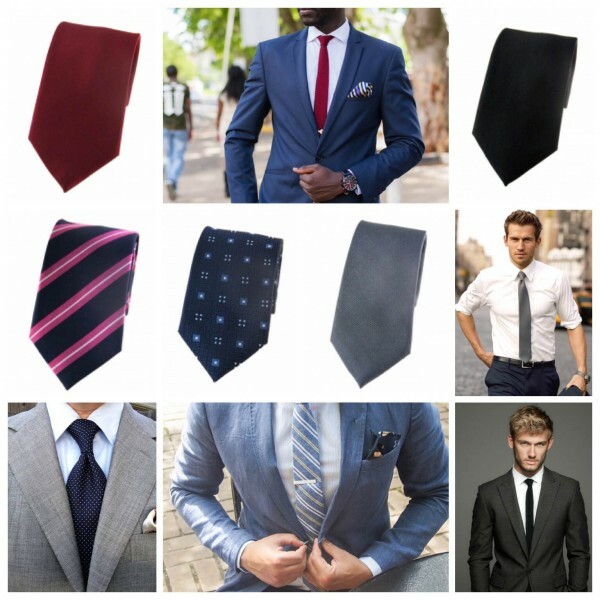 Stripes and ties are a match made in heaven, as well as the perfect way to add some subtle colour to your work look. 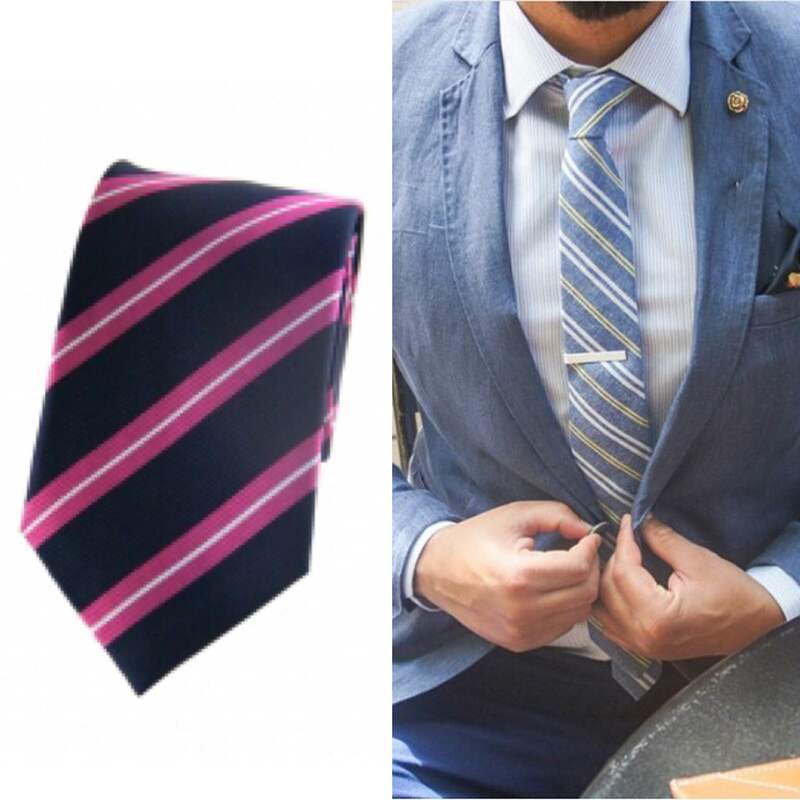 Our Travis tie keeps it classy yet quirky with its eye-catching pink and blue colour combination. Perfect for: The gentleman who likes stripes and a splash, however small, of colour at work. 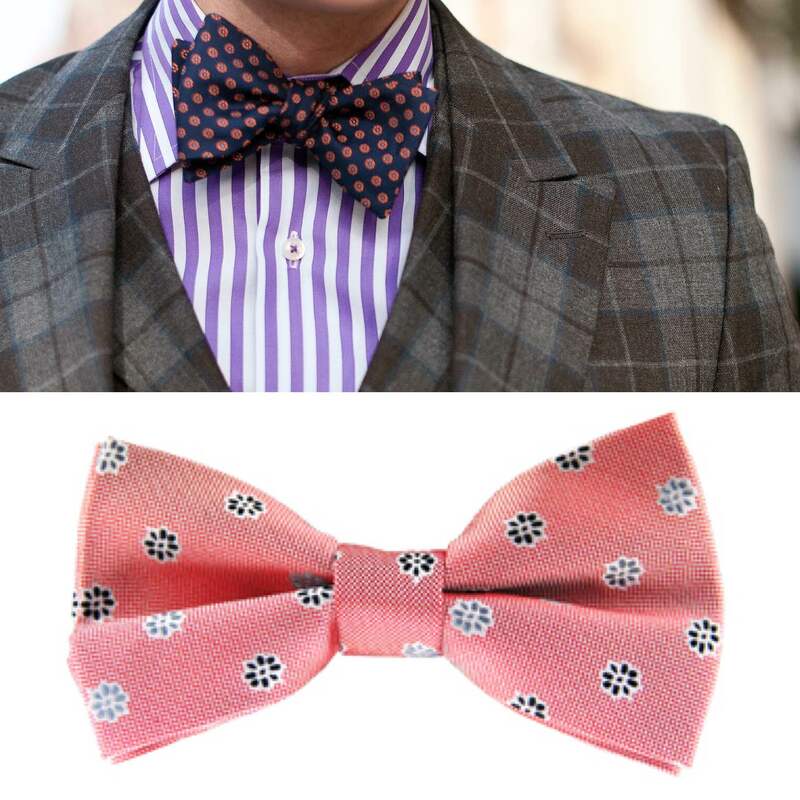 Wear it with: Its shots of pink will work wonders with a navy or blue suit. Our Zane blue print tie. Are you a fan of jazzy prints but don’t want to draw attention to yourself? 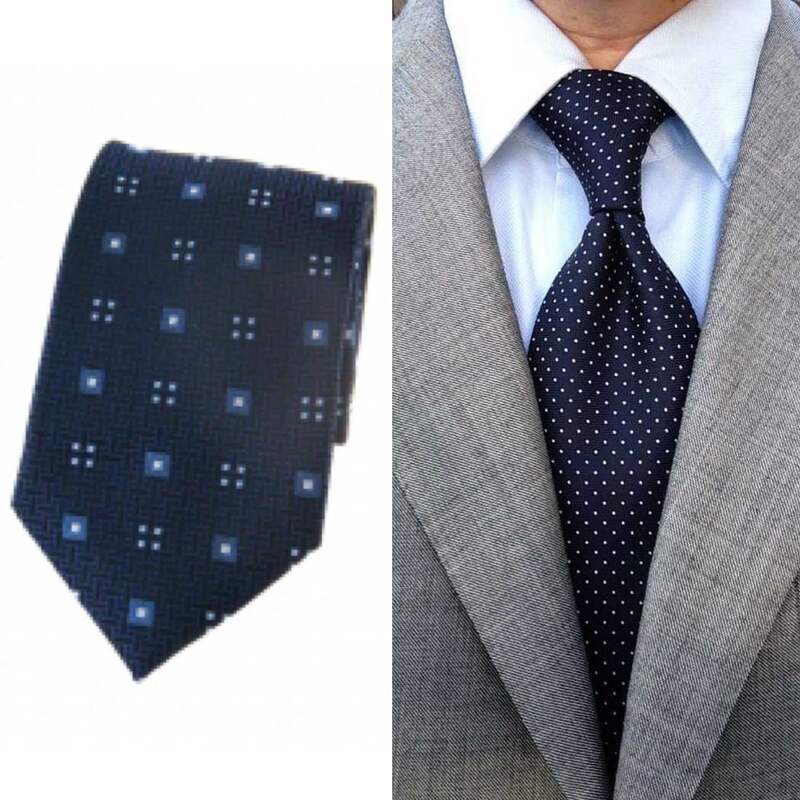 We think our Zane tie is the perfect balance of charisma and sophistication thanks to its charming graphic print and blue shade. Perfect for: The gentleman who likes classic prints. 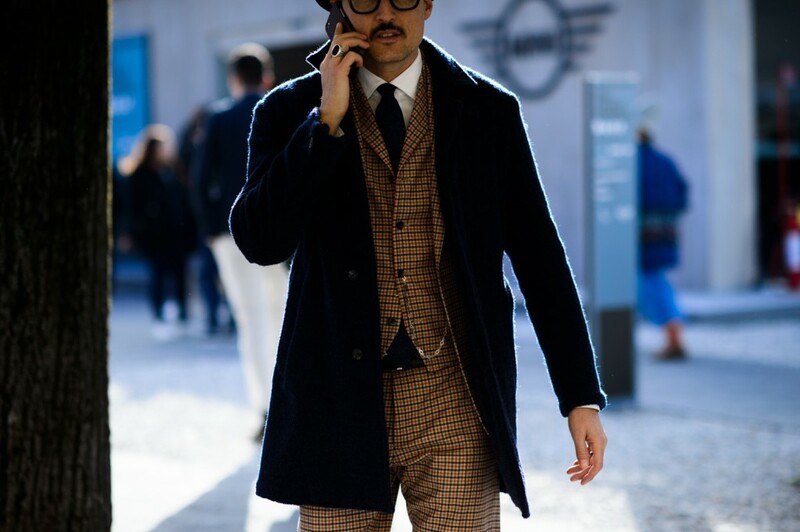 Wear it with: Stick to a sharp blue suit or make it stand out against a light grey suit. Our Justin black tie. 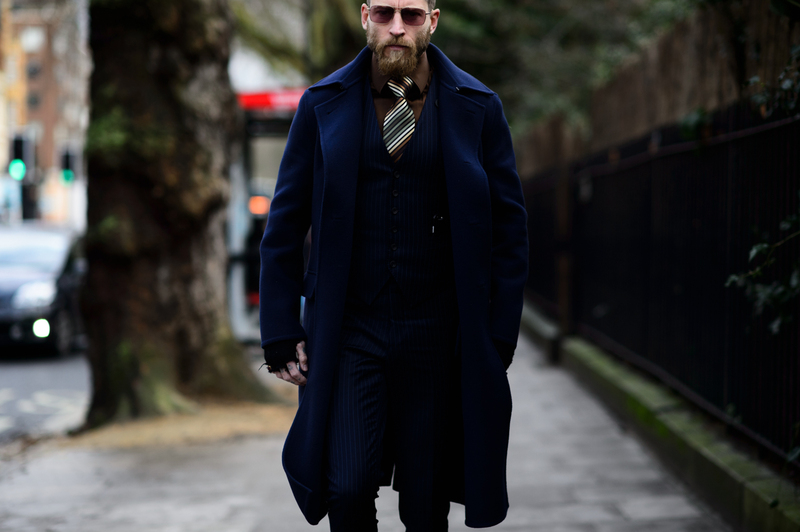 We get it if you’re a gentleman who always goes back to black – it’s serious, sophisticated and so easy. Our Justin tie is just that – a black tie with a beautiful texture and feel that will forever keep you looking sleek and timeless. Perfect for: Every gentleman out there – because everyone needs at least one black tie. Wear it with: Everything – that’s the beauty of black. Our James silver tie. 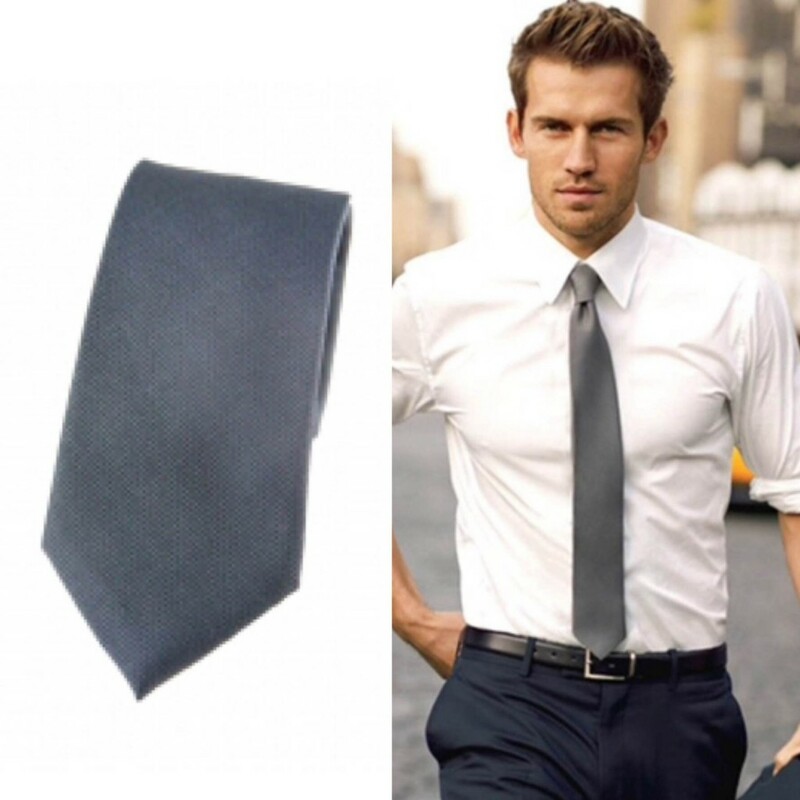 It’s no surprise Christian Grey was such a fan of grey – it’s sharp, elegant and easy to wear. Our James silver tie is pure class – if you happen to be a gentleman who likes simplicity but isn’t necessarily drawn to black, this tie was made for you. Perfect for: The corporate gentleman who never dresses down. Wear it with: Grey on grey means business. Our Jonah red tie. 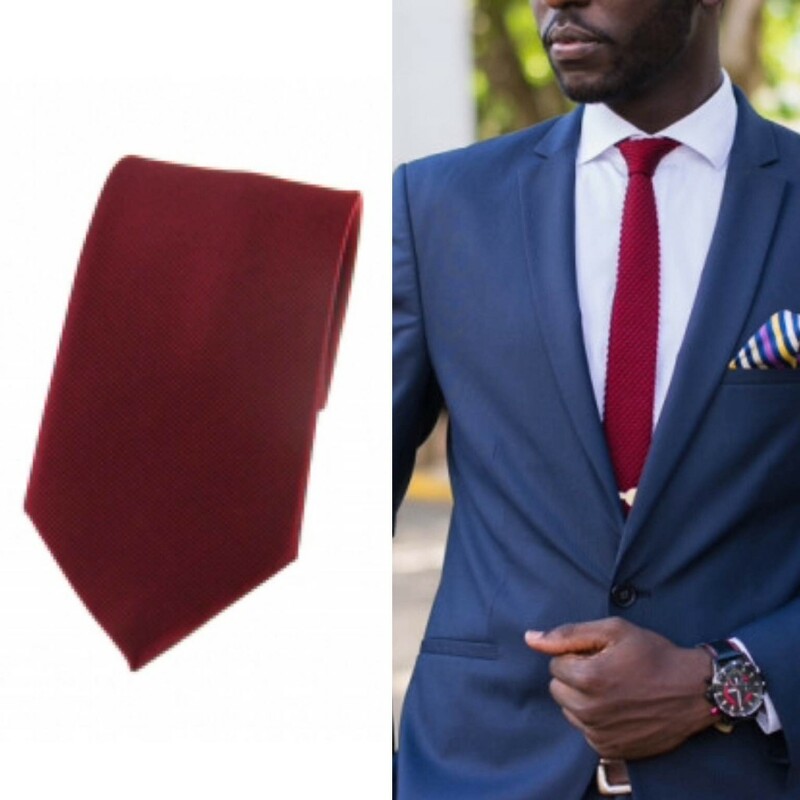 Red is synonymous with passion, so what better way is there to show your passion for work than with our Jonah tie. 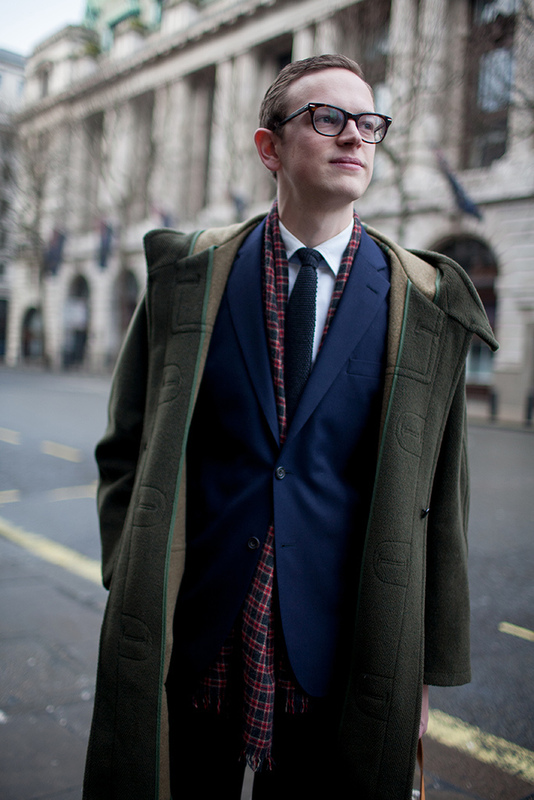 Subtle enough to look smart and eye-catching enough to make a statement, it’s just the right dose of colour for work. Perfect for: The energetic gentleman who is not afraid of making a point with his work look. Wear it with: A navy suit, blue suit, black suit… you name it, Jonah will do it. Not enough? 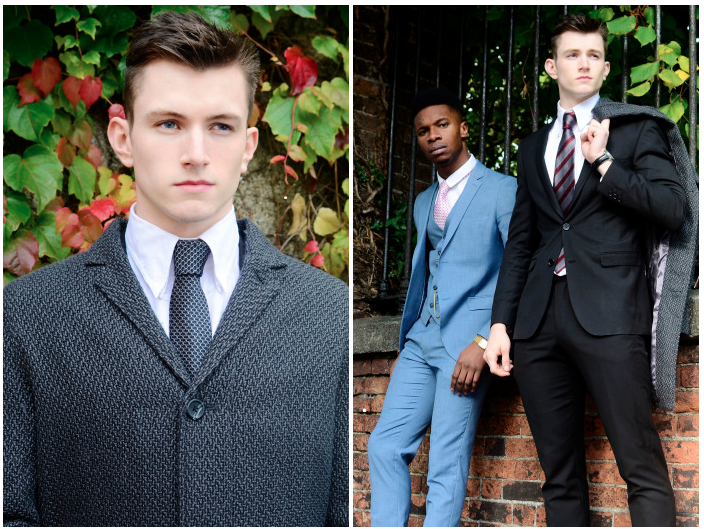 Well have a look on our website for plenty of other options – and don’t forget to post a picture of yourself wearing one of our pieces on Facebook, Twitter and Instagram! 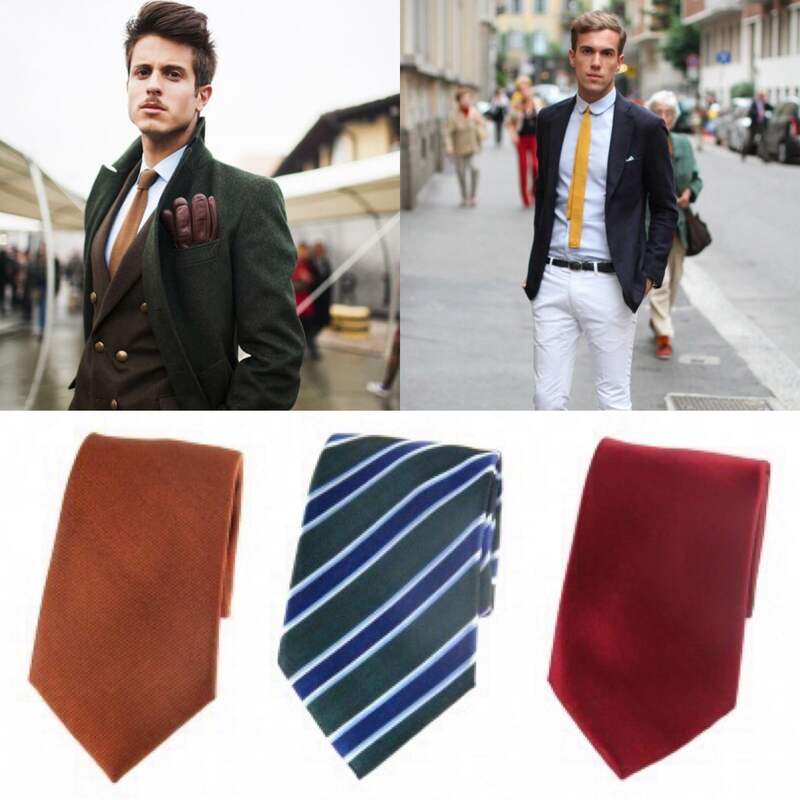 Leaves are falling, the evenings are getting darker, the days are slightly chillier and many of us are coming back from our holidays… Yes, summer may be coming to an end but autumn need not be a time of mourning, as at My Kind Of Tie we have just what a gentleman needs to go back to work in style! Autumn is known for its distinct colour palette, why not take inspiration from this? 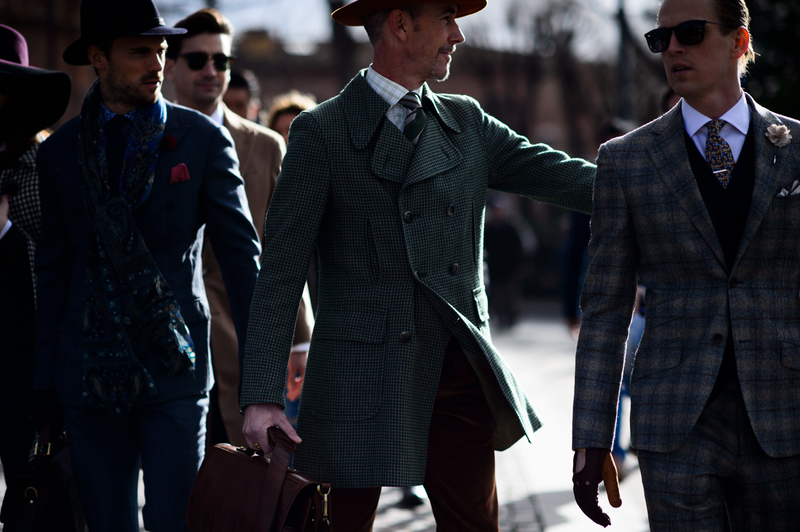 There is no better season to embrace deeper and richer shades of red, ochre and green for a true gentleman look. 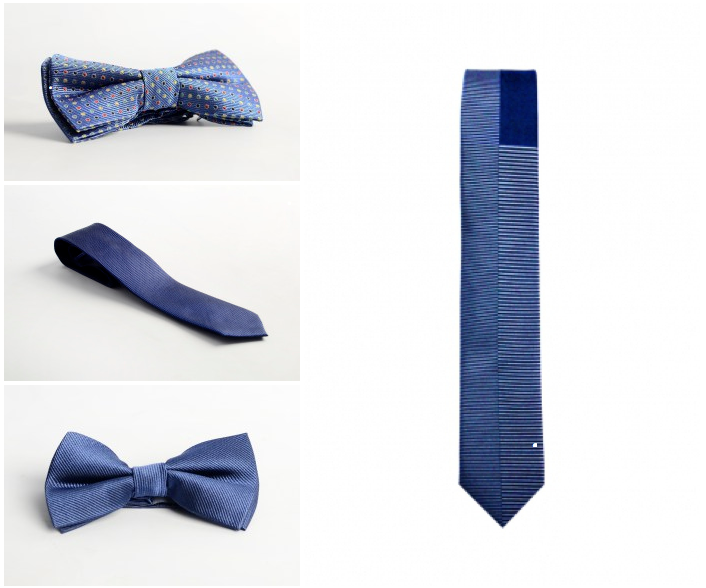 Try something new with our James plain tie. Its burnt orange shade makes an elegant statement and will subtly brighten up any dark outfit as well as those drab autumn days. For the gentleman who likes stripes as well as rich autumnal shades, our Marco striped tie will be the perfect add-on for any work suit and business meetings. 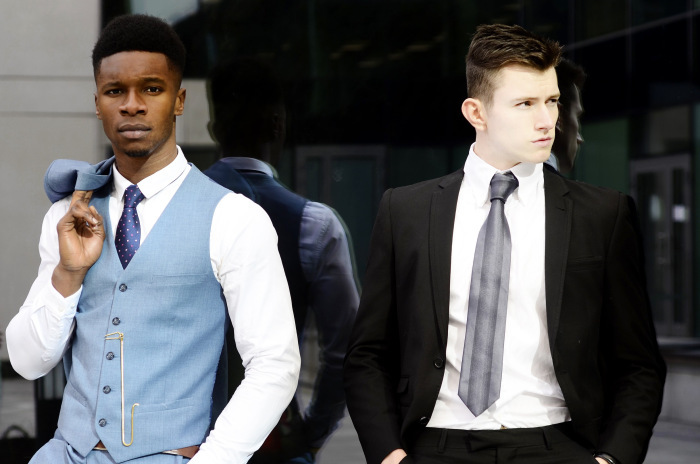 Going back to work can be tough but why not make a celebration out of it with our brilliant Jacob plain tie. Ravishing without being ostentatious, it is a beautiful tie that will add an instant touch of dash to your hard-working days. 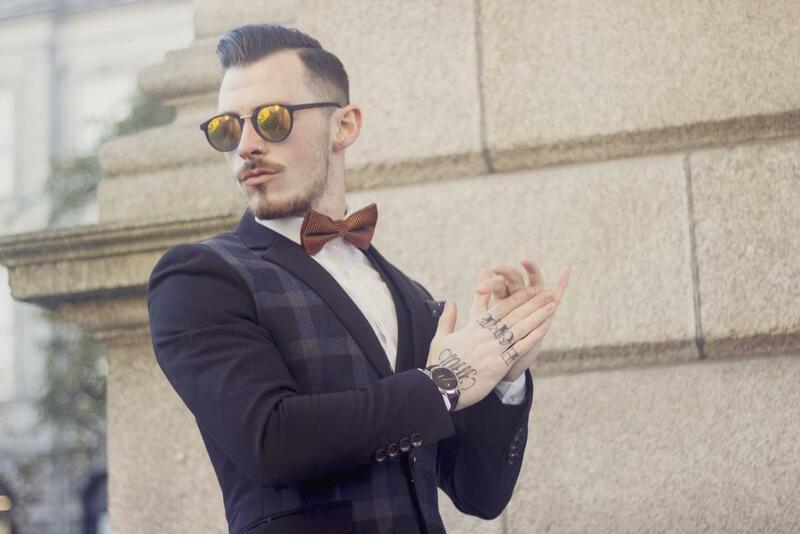 If you happen to work in a place where ties aren’t a must but looking smart is, our lustrous Ronan bow tie will make you stand out for all the right reasons this autumn. 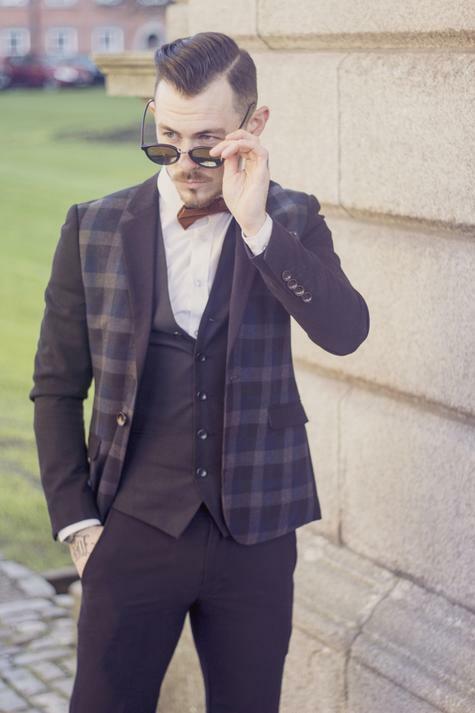 Dark chequered prints work wonders for the colder seasons and our Trace bow tie couldn’t be more dashing. Wear it for a charismatic work look with a simple grey or denim blue shirt. Our Quincy bow tie has a true autumnal feel thanks to its ochre and black palette, and will look both subtle and eye-catching against a dark suit or light plain shirt. We think our dashing ties and bow ties will instantly make going back to work a lot easier – but in the meantime enjoy the last few weeks of summer and keep in touch by following us on Facebook, Twitter and Instagram!